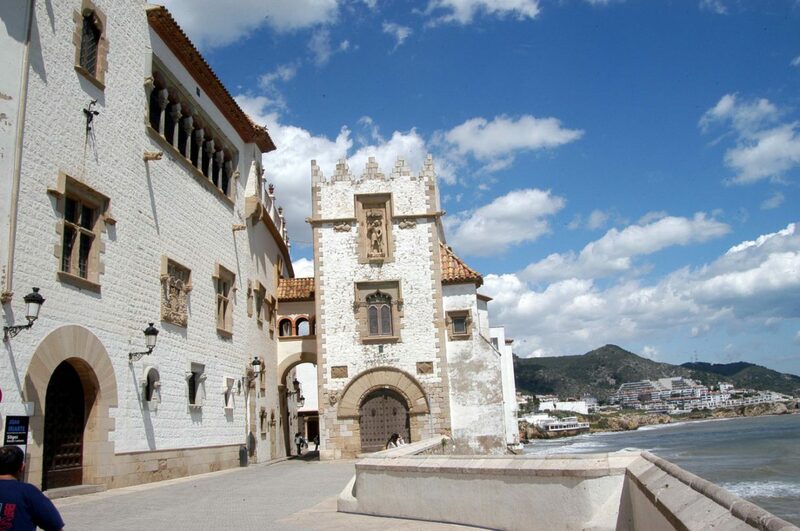 Sitges, worldwide famous for its international film festival, attracts more and more tourists every day thanks to its mix of sea, districts of white houses and its contemporary or colonial buildings. 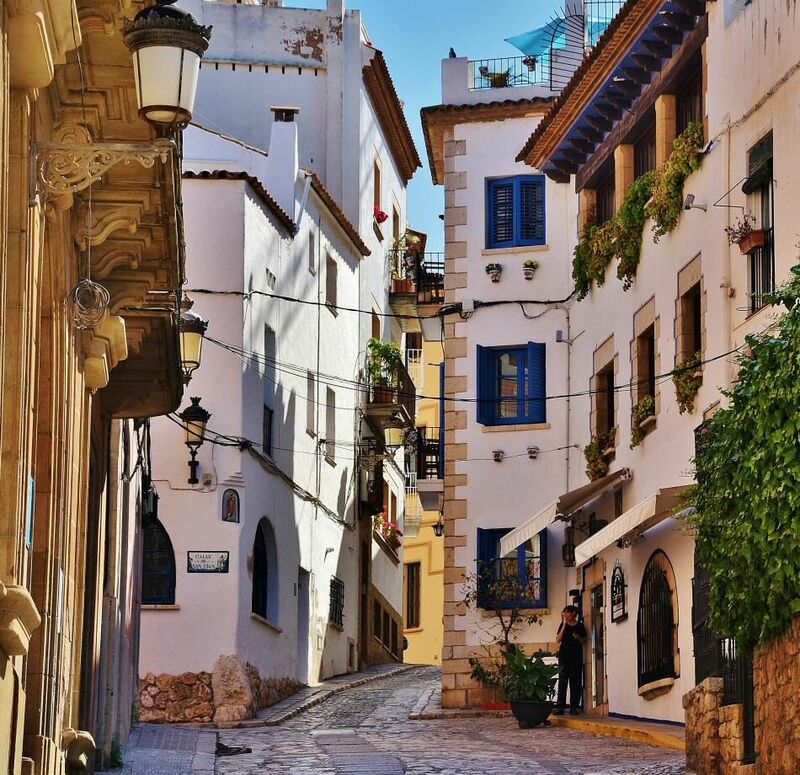 Today Sitges has become one of the most fashionable areas of the coast near Barcelona, also for photo shootings or audiovisual productions. 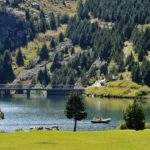 This beautiful city on the Catalan coast is much more than sun, beach and fun, it stands also for its cultural and gastronomic offer. 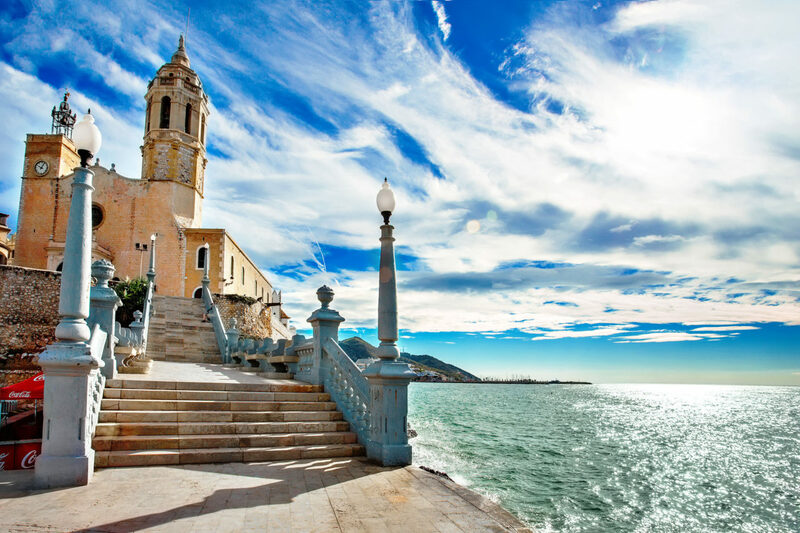 Sitges is architecturally marked by the “Americans” or “Indians” who returned from their adventures in the Spanish colonies of Cuba, the Philippines or Puerto Rico. After their return and the demolition of sections of the wall that protected the city, these “Indians” began to build their new houses, now ideal funds for your audiovisual project. A large part of the buildings that were built in the old town were of modernist style, although there are also mixtures of the styles of those times. 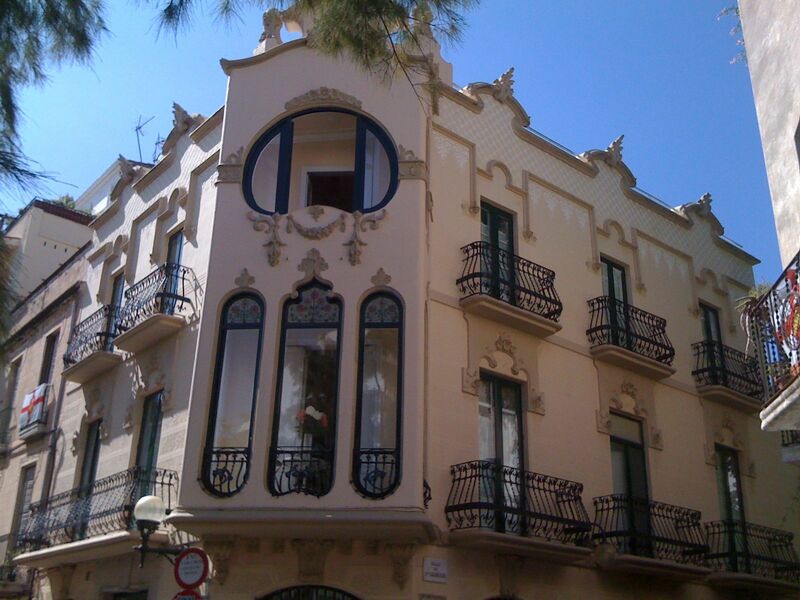 You will find a multitude of houses with the characteristic decorations in the floral forms of modernism. 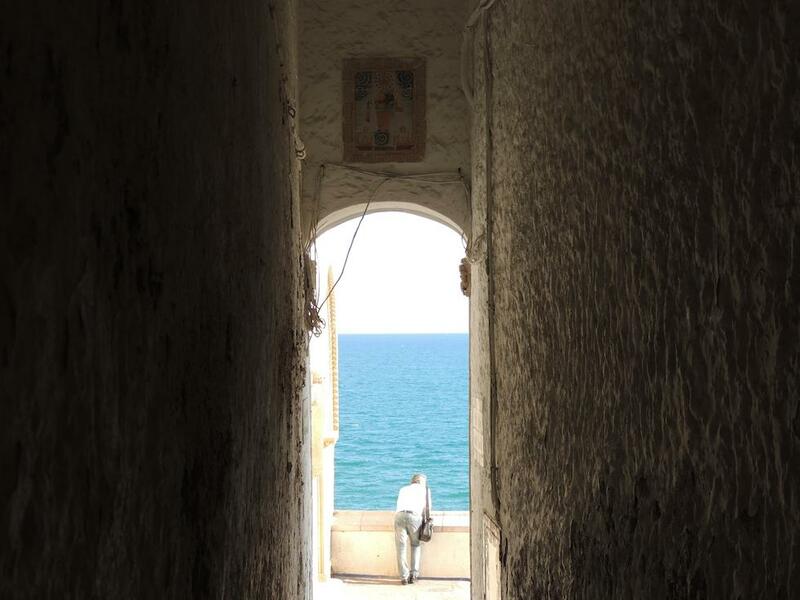 By the sea, without leaving the old town, it is worth to visit the fishing districts. The houses of the fishermen are distinguished by the white color of their facades, which is why, in earlier times, none of the more modern buildings of the old town was painted white, to distinguish themselves socially. Currently this has changed and much of the charm of the city lies nowadays in that harmony of white facades with blue touches. An ideal setting for your audiovisual productions or photographic shooting. The Promenade is not an ordinary place, since many of the buildings that occupy the first line near the sea are small mansions in the style of colonial villas. As you move away from the port and you leave the area of the hotels on the promenade, the houses that the “Indians” have build begin to appear. 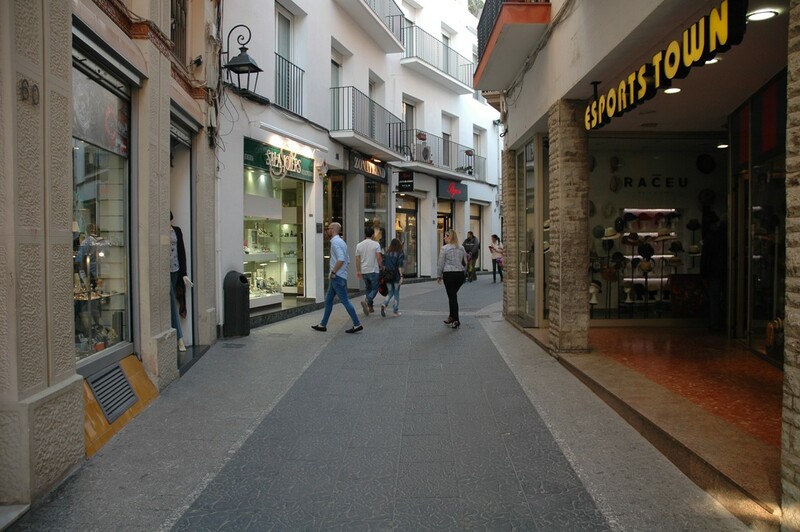 It starts in the Cap de la Vila and reaches the Plaza del Ayuntamiento. It is full of shops, clothing stores, coffee shops, decorations stores, all of them tasteful. In summer it is cool there, and a perfect place to locate your audiovisual production. A picturesque alley, nicknamed “The Fifth Avenue”. It joins Fonollar Street and the exceptional viewpoint of Miguel Utrillo with the Plaza del Ayuntamiento. One of those streets that get you hooked, by its white color, and that suddenly turns into a blue window with the sea in the background. A very marine location for your photographic shooting or audiovisual production. 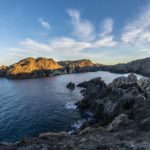 This route runs parallel to the beaches and consists of two parts, one paved and another unpaved. Its width allows everyone to enjoy it, on foot, on a bike or on skates. Its palms and other trees give it shady areas, the views of the sea are beautiful and there are everywhere bars and small beach restaurants. Always portrait painters are present and there is a statue “The Little Mermaid”, with usually sitting people around it. As you see, many locations to choose from for your audiovisual project. The Palau Maricel is a palace that originally housed eight fishermen’s houses and an adjoining building, the former hospital. Its walls are lined with colorful samples of works of art, brought from many parts of the country, as well as works by contemporary artists. There are several corners that can be used for your photographic shooting or audiovisual production, from the patio with the characteristic white and blue colors on is walls, to mosaics, or a chapel and a small cloister. The spectacular church of Sant Bartolomeu is one of the most characteristic buildings of the city. 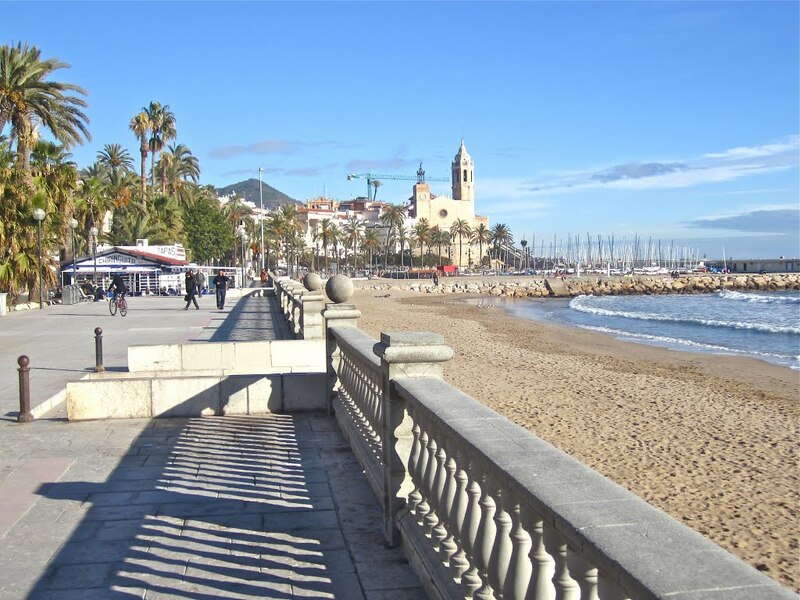 It presides from the top of a hill, at the beginning of the promenade and next to the marina, over the entire length of the coast of Sitges. Well known are its altarpieces and its two bell towers. At night is the church subtly illuminated and a nice picture for your photographic shooting or audiovisual project. 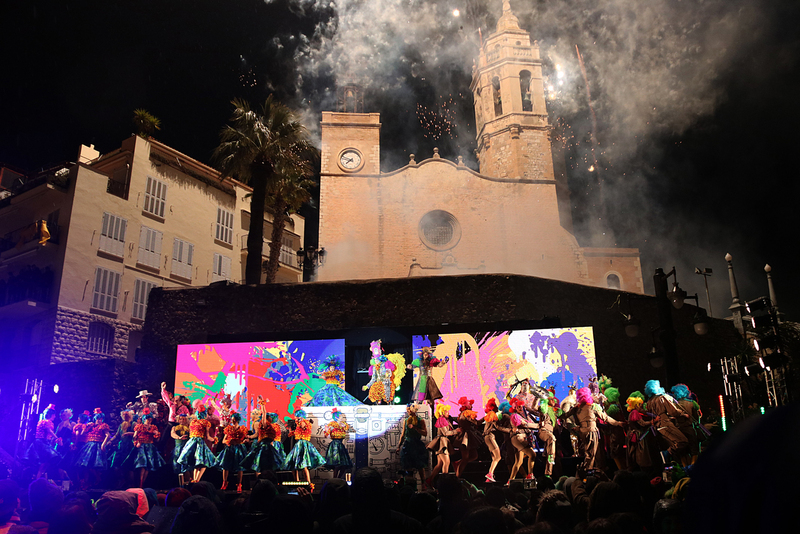 Its spectacular carnival is one of the most popular ones in Catalonia. This celebration has a history of more than 100 years and offers a unique playful environment that you can’t miss in your audiovisual production or photographic shooting. Every year, between February and March, this true spectacle of lights, colors and music is celebrated. 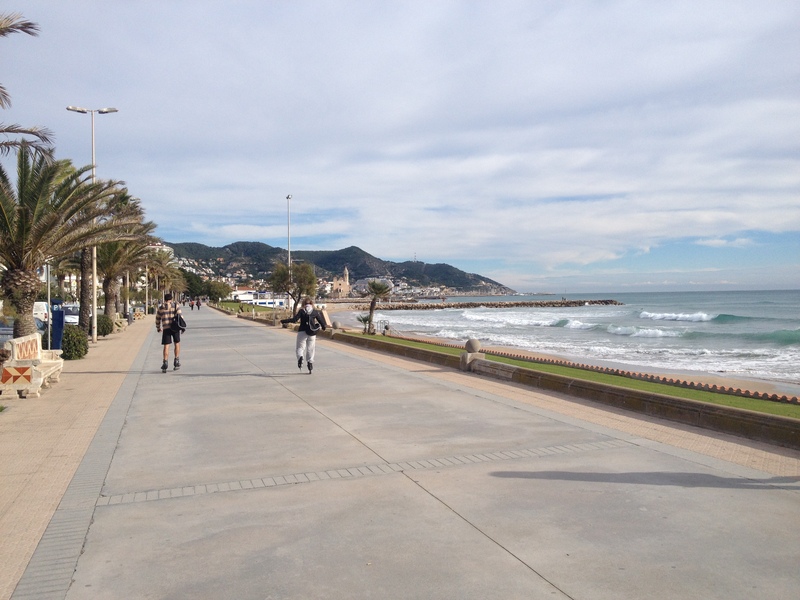 Following the coast of Sitges we can find a total of 17 beaches, inside and outside the town. Each of them has its peculiarities and special services. There are small, large, family, naturist, urban beaches, quiet coves etc. Choose according to your needs the beach that is best suited to your audiovisual project.